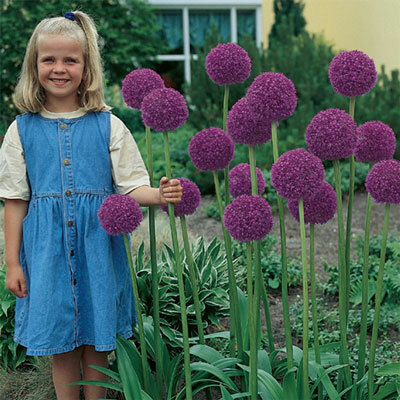 Allium Gladiator | Henry Field's Seed & Nursery Co.
Big, purple flower heads top 50- to 60-in. stems for up to 3 weeks in early summer. Sensational at the back of a border and in fresh or dried bouquets! Grows in sun or partial shade. Zones 3-9. 18-20 cm bulbs. Height 50 - 60 inches. For each offer ordered, get 5 bulbs.. Height: 50 - 60 inches. Spread: 5 - 8 inches. Foliage: Green, linear and narrow strap-like foliage. Blooms: June-July. Early summer, blooms for about 3 weeks. Flower Form: Spherical flowers of hundreds of tiny florets. Size: 4 - 5 inch wide umbels.